Female friends are special. I often wonder what I would do without them. So I like to take note of stories about longtime women friends. This was particularly true during the past week. 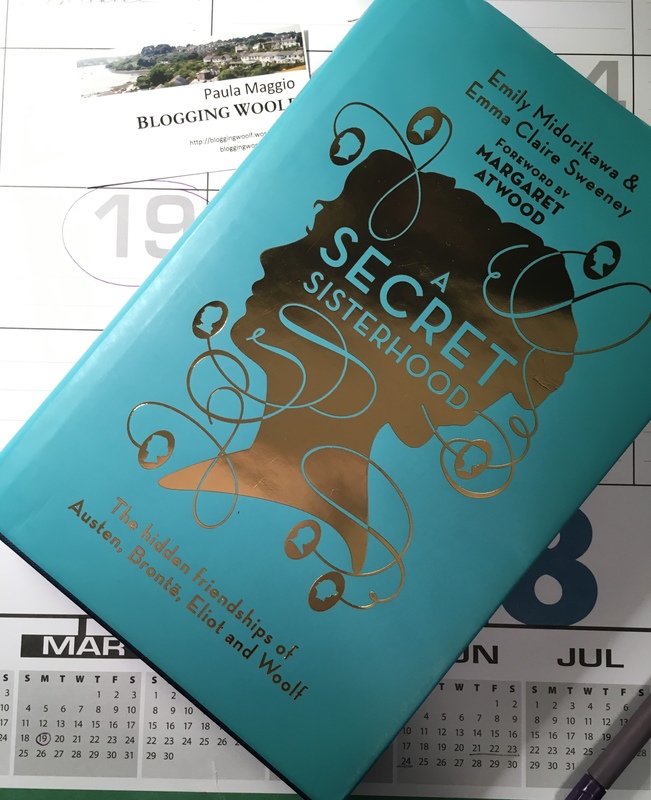 Knowing that today I was on the blog tour schedule to publish a review of A Secret Sisterhood: The Literary Friendships of Jane Austen, Charlotte Brontë, George Eliot, and Virginia Woolf, by Emily Midorikawa and Emma Claire Sweeney, stories of women’s friendships kept popping out at me. I’ll share just two of them before adding the promised review. 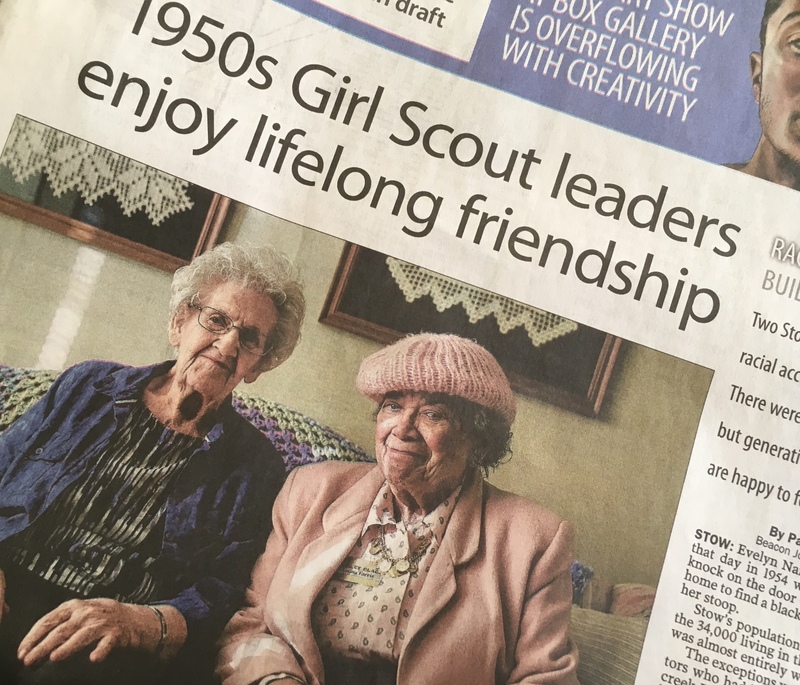 Akron Beacon Journal article featuring the lifelong friendship of two women, now 94 and 100. Yesterday, the front page of my local newspaper featured such a close friendship. It told the story of two women — one black, one white — who led a Girl Scout troop in an all-white community back in 1954 and became fast friends, as did their daughters. Last week, a lecture I attended by Rebecca Traister, author of All the Single Ladies: Unmarried Women and the Rise of an Independent Nation (2016) spoke of the importance of women’s friendships throughout U.S. history. She also emphasized how those intimate friendships sustained and supported women when their marriage relationships, often entered into solely for financial reasons, did not. Women writers had sustaining friendships with female friends, too. But as Margaret Atwood says in her foreward to A Secret Sisterhood, female literary friendships have often been overlooked. Midorikawa and Sweeney bring them into the limelight in their 2017 book, A Secret Sisterhood. Now out in paperback in the UK, it explores the “secret sisterhoods” entered into by Jane Austen, Charlotte Brontë, George Eliot and Virginia Woolf. My focus will be on the book’s final section, whose three chapters explore the ambivalent friendship between Woolf and Katherine Mansfield. Woolf and Mansfield: friends or foes, cat or mouse? Anyone who studies Woolf knows that there is much discussion of the love-hate relationship between Woolf and Mansfield. In Secret Sisters, Midorikawa and Sweeney bring it into clear focus. 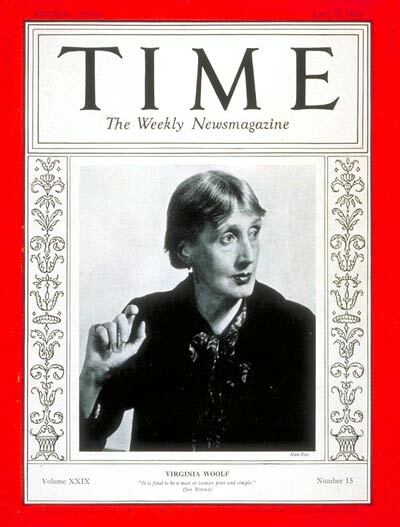 They are careful to describe the complicated relationship between the two, showing us how and why Woolf considered Mansfield both her “bitter opponent and beloved friend — unrivaled by any other” (260). They use excerpts from letters, diaries and more to compile a detailed timeline that clarifies the relationship without oversimplifying its nuances. The authors follow the relationship between the two writers from its spring 1917 beginnings in Mansfield’s humble Chelsea flat, where Woolf offered Mansfield the opportunity to have her work published with the newly formed Hogarth Press, to the news, delivered by Woolf’s maid Nellie Boxall in January 1923, that Mansfield had died. In between, Midorikawa and Sweeney document the ups and downs of their professional alliance, as well as their personal relationship. Among them are Garsington gossip, the rivalry between the two to use the Garsington garden as the setting for a short story, and the ways they supported each other’s literary careers while engaging in creative competition. We also get an inside view of Mansfield’s ill health and financial challenges, Woolf’s mixed feelings about Mansfield’s work, and the insecurities each woman had about the other as both a trusted friend and literary sounding board. A Secret Sisterhood lays out the intimate inner workings of the friendship and competition between Woolf and Mansfield, setting theories and rumors to rest and illuminating a relationship characterized by a “rare sense of communion” (250) that has interested their readers for decades.